Samsung Electronics (SSNLF) is taking aim at Apple and other competitors in the laptop market this year with an ambitious plan to boost its sales by 80%, according to a Bloomberg report. Key to that effort will be its ultrathin 9 Series notebook, designed to go head-to-head with Apple's MacBook Air. The South Korean electronics maker kicked off sales of the notebooks in its home country Thursday. 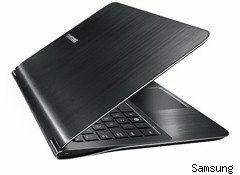 Samsung's goal is to increase its global laptop market share to around 7% this year by selling an 18 million units, compared to the approximate 5% market share the company held last year, the Bloomberg article noted. Samsung plans to expand sales of the 9 Series machines to the U.S. and other nations in March. The laptop will sell for 2.49 million won, or $2,210, a much higher base price than the latest version of Apple's (AAPL) comparably sized 13-inch MacBook Air, which came on the market in October at a starting price of $1,299. At least part of the price difference is a matter of what's under the hood. The base model 13-inch MacBook Air offers 2GB of RAM, but for $100 more, it can be upgraded to 4GB like Samsung's 9 Series. Their featherweight dimensions are remarkably similar: Samsung's 13.3-inch 9 Series weighs 2.89 pounds and is a svelte 0.64-inches thick, while the MacBook Air weighs in at 2.3 pounds and is 0.68 inches at its widest point. The 9 Series is part of Samsung's longer-term strategy to goose its revenues by focusing on higher-end products, and the in-your-face battle between Samsung and Apple extends beyond laptops. Samsung's Galaxy smartphone and recently released Android-based Galaxy Tab are other areas where the rivals are going head-to-head. Samsung sold 10 million Galaxy S smartphones in the seven-month period after their release last June. That's a respectable performance, in light of the iPhone 4 release around the same time. The iPhone 4, however, shipped 3 million units within just three weeks. The Galaxy Tab launched roughly five months after Apple's highly touted iPad hit the stores last April, and Apple is expected to unveil a refresh of its iPad on March 2. But Samsung has managed to respond fairly rapidly to product rollouts from its erstwhile rival. Maybe a Galaxy Tab redesign is coming, too.